Every desk at Red Letter Marketing has at least three screens on display: multiple computer monitors, smart phones, and tablets. 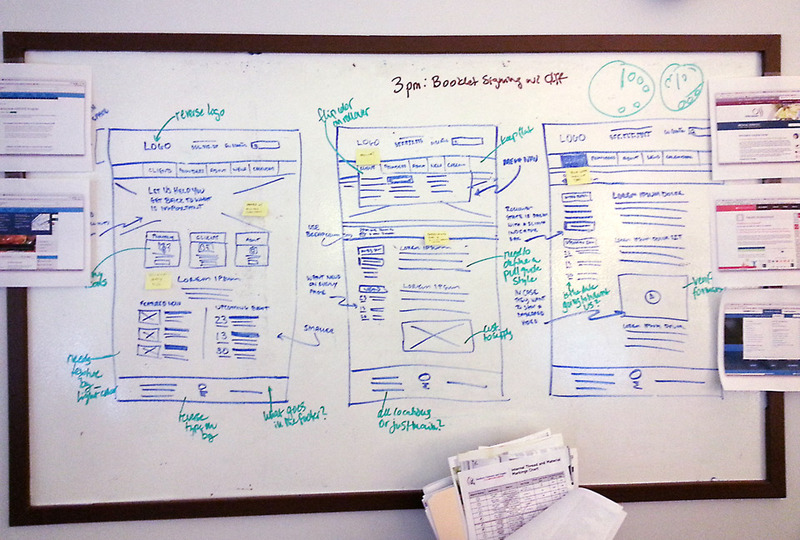 But our favorite brainstorming and puzzle solving tool is the good old whiteboard. 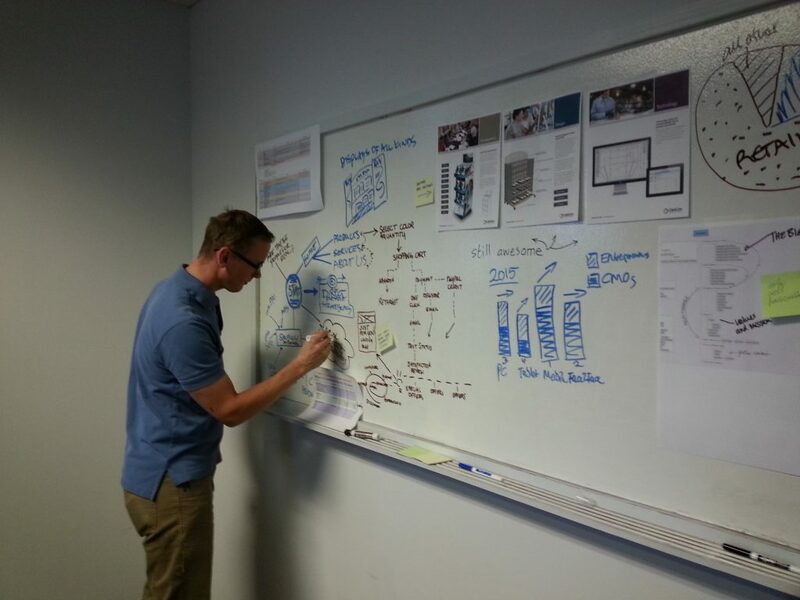 Our main conference room has a 14-foot whiteboard that inspires team members and clients alike to bigger thinking. Every desk has at least one within arm’s reach, and you never know what you’ll see on them. Research has shown that our brains are more active when we stand, move around, and physically write things down rather than typing into a keyboard. 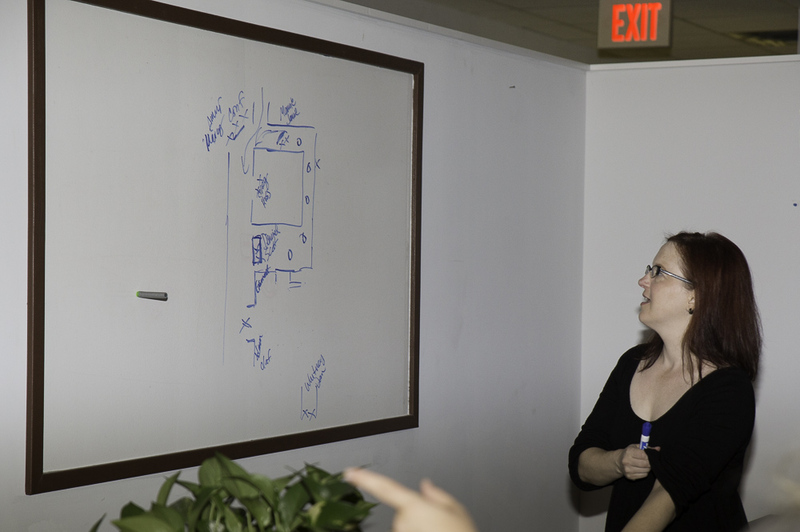 If our whiteboards could talk, they would have many a tale to tell of coding puzzles solved, sitemaps brainstormed, and headlines rewritten. 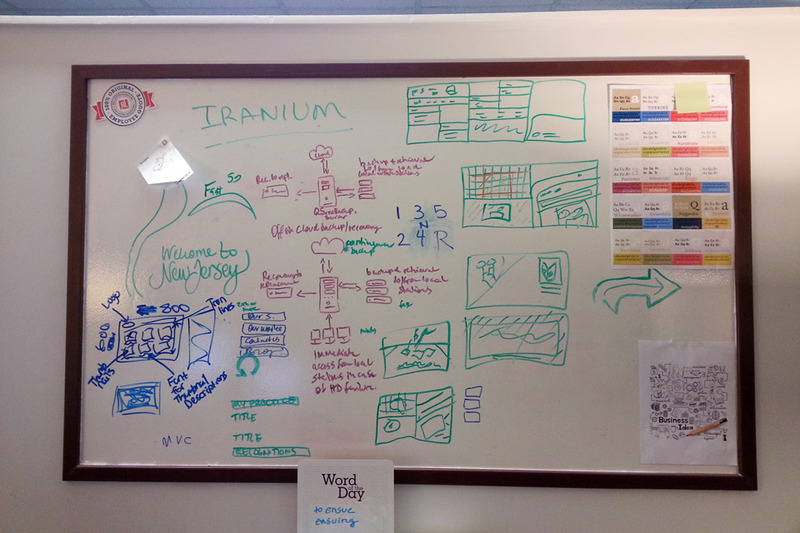 In the spirit of sharing the chaotic processes of our creative and strategic minds, we thought to put our brains on display – well, our whiteboards (much less invasive). Here you see the rare inner-workings of German design. This is the board of our Lead Designer, Olaf. Don’t ask us what any of this means. And don’t ask Olaf either. He’s concentrating. Opposite Olaf’s musings you’ll see the board between Garrett, another member of the design team. He can tailor a page like a fine suit, but don’t look toward the top right –it looks like he struggles with analog clocks. We don’t know what Olaf is doing here, but it looks important. Plotting the shortest way to getting his Costco shopping done, perhaps. 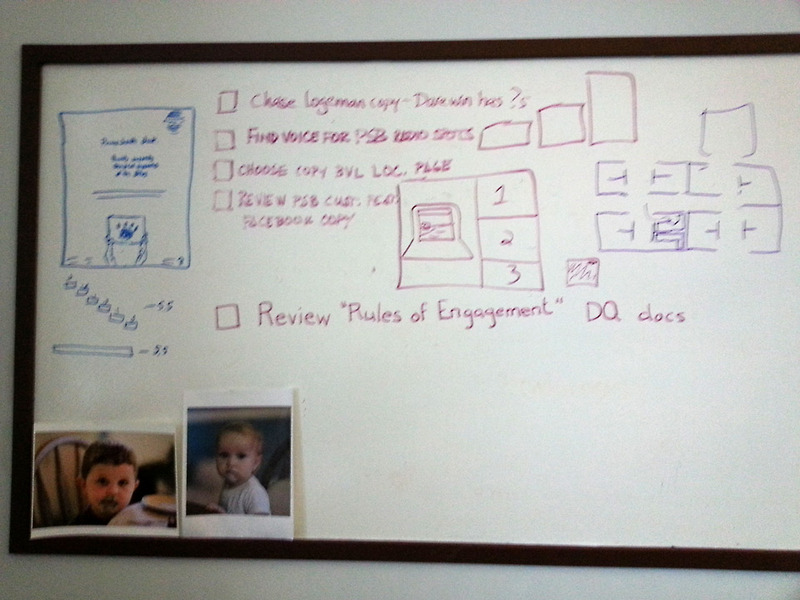 White board strategy was the key to our Nerf War Victory over our sister company, Dynamic Quest. Here, Marcy plots hallway ambush tactics. Sean always has some sort of strategy plotted out on his white board. And by the way, he is a doting daddy, can you tell? This board hangs in the office of our creative director, Mike. 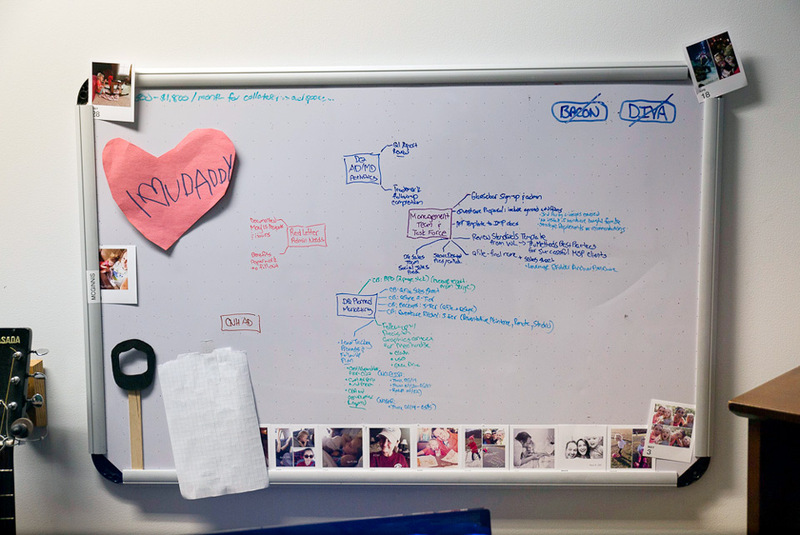 On this particular occasion the board features a sketch of a print ad; a to-do list, without which Mike would be rudderless; a new floor plan for our office; a rudimentary Gantt chart, and a couple of photos of his grandkids. Somehow, he failed to include a sketch of a kitchen sink. 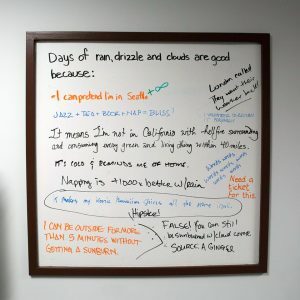 We even keep a whiteboard in the breakroom that rotates subjects every few days. If someone has an idea, they throw it up there and wait for retorts as we swim in and out for coffee, tea, and (on Fridays) biscuits made by our front-end developer, Scott. This board is from last fall, when the Carolinas saw unprecedented rainfall. Some of our clients like to have meetings at our place rather than theirs, just so they can write on our giant white board. But we can’t show those.